NCR Student Competition – Win! 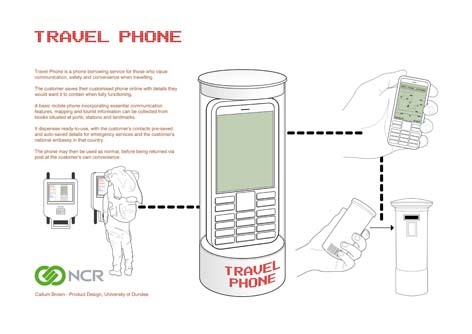 Product Level 3 student, Callum Brown, wins the NCR student competition with his project “Travel Phone”. “Travel Phone is a mobile phone rental service that encourages safe and convenient travel through the up-keep of communication and safety abroad. At a kiosk at their destination, the customer can pay and collect a phone containing their pre-saved preferences, to use throughout their visit in that country, and return it via post at the end of their journey. The phone incorporates basic communication features, a GPS map and tourist information, and comes as standard with a USB cable for charging on-the-go. Accessory upgrades are offered to cater for individual travel needs. It allows the customer travel comfortably knowing that they can easily contact emergency services, their national embassy, or find a place to eat and stay, without worrying about caring for a valuable phone. Roles are reversed – the phone looks after the user, and through simple design, it prevents them standing out in a busy, intimidating environment. Payment schemes: deposit; up-front fee etc. ; are handled by the network service provider. Self-service kiosks incorporating touch-screen, chip & pin and phone dispenser, is made by NCR. Since NCR are looking at directing their design straight at the user, it may too be viable for them to manufacture the phone.